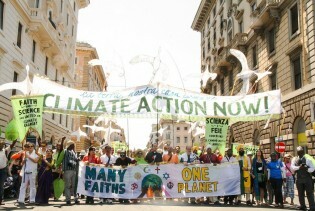 People of faith, civil society groups, and communities affected by climate change marched together in Rome Sunday Jun. 28 to express gratitude to Pope Francis for the release of his Laudato Si encyclical on the environment, and call for bolder climate action by world leaders. Watching videos and pictures on social media of the advance of the Islamic State (IS) inside Syria made it all seem far from reality to Iraqi Marvin Nafee. “Only two years ago, the soup kitchen was serving 50 meals a day. Today the number has almost doubled and, what is even more worrying, we have started receiving families with children,” says Donatella Turri, director of the Caritas Diocese of Lucca. “I don’t want them to grow up with the notion that they’re poor,” says Catalina González, referring to her two young sons. The family has been living in an apartment rent-free since December in exchange for fixing it up, in the southern Spanish city of Málaga. Some 50,000 files on crimes against humanity are languishing in an undisclosed location in El Salvador, prey to damp and the ravages of time, while activists and lawyers frantically try to regain control over them.